Out my back porch I am fortunate to watch the antics of a nesting pair of Bald Eagles (Haliaeetus leucocephalus). It is a fascinating experience, one that even my Brittany Spaniel has come to share by raising his head and cocking his ears in anticipation when their sharp whistling cries echo in the neighbourhood. He appears to know that the cry is the greeting call of one of the eagles at the nest as it calls to it's incoming mate, or, a warning call to other eagles that have trespassed on this pair's aerial territory. Whichever, he seems to understand that he will soon see the flight of one of these massive birds of prey as they come into view with wide spread wings and outstretched bright yellow legs and claws. In my travels throughout B.C. I have been fortunate to watch the Bald Eagle in Interior skyline mountains and along Coastal streams and inlets. They are massive birds, measuring 3 feet from head to tail, and weigh from 7 to 10 pounds. The males have a wingspan of about 7 feet while the females are larger, some reaching 14 pounds with a wingspan up to 8 feet. Measure that on the carpet, or, have someone six feet tall stretch their arms fully upward to get a true picture of just how big are these largest of North American birds of prey! It has been said that the Bald Eagle is truly an all North American bird being the only eagle unique to this continent. It is known to inhabit the regions of the northern reaches of Alaska and Canada, south to northern Mexico. The Golden Eagle is the only other eagle common to North America. Subadult Bald Eagles can be mistaken for the Golden Eagle because it takes four years for them to attain the white head and tail of an adult bird. It is interesting to know that another large bird, the Turkey Vulture, is often mistaken for the Bald Eagle. However, up close, the bright red head and neck of the Turkey Vulture make it obvious. As a general rule I have found the use of the 'five finger view' a good check to distinguish between an immature Bald Eagle and a Turkey Vulture in flight. When soaring and circling overhead, the five primary flight feathers of the Turkey Vulture spread out like the fingers on your hand. But, the Bald Eagle flight feathers remain together, almost cupped while soaring. 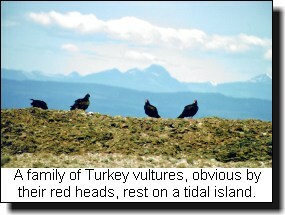 Turkey Vultures have been expanding their territory in recent years so don't be surprised if that Bald Eagle overhead is in fact a Turkey Vulture. Bald Eagles have increased substantially since the banning of DDT in the 70's. They are no longer rare and endangered, rather their status has been upgraded in recent years and they are close to being taken completely off the list of endangered species in the lower 48 states. 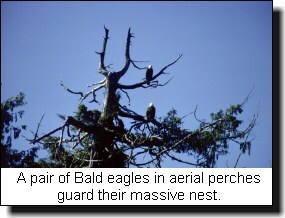 Bald Eagles mate for life and build huge nests in the tops of large trees near the coast and along rivers and lakes. Nests are re-used year after year with twigs and branches being added to the nest each year. Some nests have been known to reach 10 feet across and weigh as much as 1500 pounds. Bald Eagles may range over great distances, but, they usually return to nest near where they were raised. The staple food for most Bald Eagle is fish, but they will feed on almost anything they can catch including ducks, rodents and snakes. Because of their obvious preference for spawning salmon they are a common sight along all northwest coastal rivers. I like to think I have a pet Bald Eagle on one of the coastal islands where I fish on a regular basis. This particular bird is almost always seen on the high branches of a windswept Douglas fir. When I arrive in the area I have found that it will dive down in a classic strike should I throw some baitfish on the surface. All it takes is a sharp whistle on my part to get a responsive cry from the eagle, then a wide sweep of my arms to show the fish I am throwing out. The eagle will wait a few minutes, until my boat has drifted clear of the baitfish, and then it will launch itself from it's aerie. As it gets closer to the floating fish it extends its bright yellow feet then glides down over the bait grabbing the fish in one or both claws. It is interesting to note that I have yet to see this particular eagle miss a first strike. 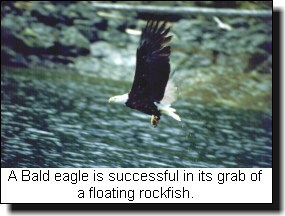 Bald Eagles breed all across Canada, Alaska, and in many U.S. northern states. In the winter these northern birds migrate south and gather in large numbers near open water areas where fish or other prey are plentiful. They congregate in massive numbers in small coastal estuaries where spawned salmon are their main feed. In 1782, when the Bald Eagle was proclaimed as the U.S. national symbol, it is estimated that there were between 25,000 to as many as 75,000 nesting pairs of Bald Eagles in the U.S. By the early 1960s there were fewer than 450 bald eagle nesting pairs in the lower 48 states. Now, however, it is estimated that there are 4500 nesting pairs with at least one nesting pair in every state in the lower 48 states. There are no Bald Eagles in Hawaii but there are an estimated 40,000 eagles in Alaska. 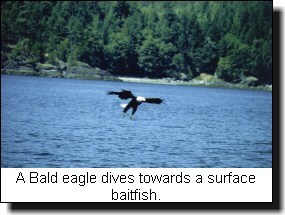 In Canada, no accurate numbers appear possible, however populations are stable and increasing, and the Bald Eagle is no longer considered threatened or vulnerable. 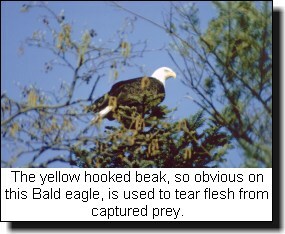 Bald Eagles have few natural enemies but they require a large territory. Fish contaminated with DDT and other pesticides were the deadliest killers of eagles and other birds of prey that fed on fish where these contaminants concentrated. Fortunately legislation in Canada and the U.S. has banned the use of many of these poisons. It is now thought that ingested lead shot in waterfowl, another key food of eagles, also poisoned these birds. Legislation in the 90's banning lead shot is expected to halt this probable poison. Thanks to the concentrated efforts of many on both sides of the border we can all be thankful that the Bald Eagle has become another wildlife species success story!